Princeton University has a #1 university rating from US News, a beautiful walkable campus, and offers amazing financial support to its students. But given the choice, students are choosing to attend Harvard, Yale, Stanford or even the University of Chicago instead. Why are students turning down Princeton U? For any individual, a bunch of personal factors go into making a college choice. Family reasons, boyfriend/girlfriend considerations, and college-specific strengths in a particular subject will all be factored in. But the website Parchment has analyzed student preferences using data from 104,219 college applicants. Their data show where students go when they hold more than one offer, and there is often a pattern. By this measure, the best school is the one that students always choose, even when they have offers from elsewhere. When it comes to Princeton, 81% of students chose Stanford when they had offers from both schools. That’s not even close. Harvard, Yale and the University of Chicago also drew a majority of students who held offers from Princeton U. For some reason, students seem to prefer those colleges over #1-ranked Princeton. The findings are unlikely to cause alarm in the admissions office at Nassau Hall. The total number of students lost to other schools is quite small, and Princeton U. is able to turn away more than 90% of the students that apply. But it is interesting to consider why Princeton isn’t the #1 choice for every student, considering it regularly tops published university league tables. – One possible reason is that the US News and other rankings place too much weight on factors that don’t matter to a student deliberating between two colleges. University league tables are notorious for using spurious factors such as ‘percentage of alumni who donate’ as a measure of university quality. Students might perceive that Harvard and Yale are just better schools, no matter what the league tables say. – Another possibility is that there is a perception that studying at Princeton U. means putting up with a cliquey, elitist scene. That perception may be unfair, and the University has done a lot to ensure a diverse student body, but every year the ‘Daily Princetonian’ obsesses over the ‘bicker’ thing and what ‘eating club’ on Prospect Avenue is drawing the most applicants. – Finally, and much as it pains us to consider this, it might be that the town of Princeton is just not perceived as a cool place to study, especially compared to Cambridge, Silicon Valley, or Chicago. 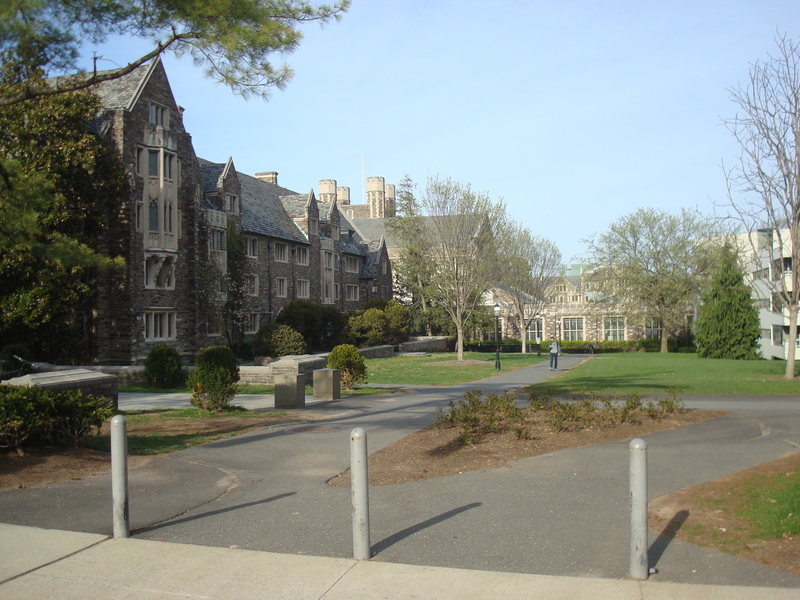 In recent years, several of Princeton U.’s celebrity faculty have left town, and Princeton is seldom found on lists of ‘Best College Towns’. Which of these reasons do you think explain why students don’t choose Princeton? Or what other reasons can you think of? Do you know anyone who turned down an offer from Princeton? Leave us your thoughts and comments using the form below. This entry was posted in Uncategorized and tagged colleges, Princeton, Princeton University. Bookmark the permalink. 5 Responses to Why Do Some Students Reject Offers From Princeton University? I know of a Swedish applicant who loved Princeton on his visit, but when choosing between Princeton, Yale and Brown chose Yale. He was concerned that he would earn lower grades for the same work at Princeton than at Yale and feared that would put him at a dis-advantge competing against other Ivy Leaguers in an international job market. He feared that while US recruiters might know of Princeton’s reputation for grade deflation, international recruiters would not. Ummm (and I’m being a sarcastic SOB) but Princeton is in NJ and the town is not really friendly for biking despite claims and awards. Still, if I had a choice between a free ride to Princeton or Stanford, Stanford would be hard to turn down. You can get such a damn good education at either school and Stanford is just such a cool place to live. There is not much Princeton can do to change that. However Stanford does happen to be a Platinum level Bicycle Friendly University. Princeton has a long way to go in that regard. Kathy brings up a good point too. Probably Princeton’s reputation for preppiness. It attracts a certain type of student. And let’s face it, as lovely as the town of Princeton is, it isn’t as exciting as Chicago, Palo Alto or maybe even New Haven. I would say location and the university’s history of exclusivity such as the Dirty Bicker scandal. Main reason that students are rejecting Princeton is because of the grade deflation. This is a very well known fact about Princeton. Even though the college states they are trying to put a end to it — it still very much exists according to students. Seniors visiting Princeton liked how comfortable they felt when visiting Princeton but in the end elected to go to other Ivy league colleges because of the grade-deflation policy. Grade deflation pits the students against each other and causes stress throughout the campus. Instead of working together students tend to learn and work on their own. Princeton should realize that when people work together great things can happen. Working together can solve the worlds problems and create a great learning experience among their students. Students that get accepted to the Ivy league colleges are already high achievers– they are the worlds smartest students and yes grades do mean everything to them. When you work hard to get the A you should get to kept the A. This grade deflation is a dis-advantage when competing against other Ivy League students in any job market. Recruiters chose the applicant with the highest GPA. When considering graduate school your GPA does make or break your changes of attending. Your GPA could break your chances of obtaining your dreams. I hear Princeton has the best professors of all the Ivy league schools and they really do care about the under graduate and their students well being. If they could just change this policy –they would create a better college experience for all their students. I hear the new Dean is doing everything possible to try to get rid of the grade deflation policy. If he does– Princeton will be among the best places to attend college. I rejected Princeton based partly on the location, the length of the walk from one end of campus to the other, and the administration’s open hostility to public transportation. If I have to drive everywhere, I’d rather not be driving in New Jersey. The town of Princeton is pretty dead for a college town. I suppose Williams is worse. Also, subjectively, Princeton has a nicer culture than Harvard or Yale, but substantially more elitist than most of the rest of the top colleges in the country.